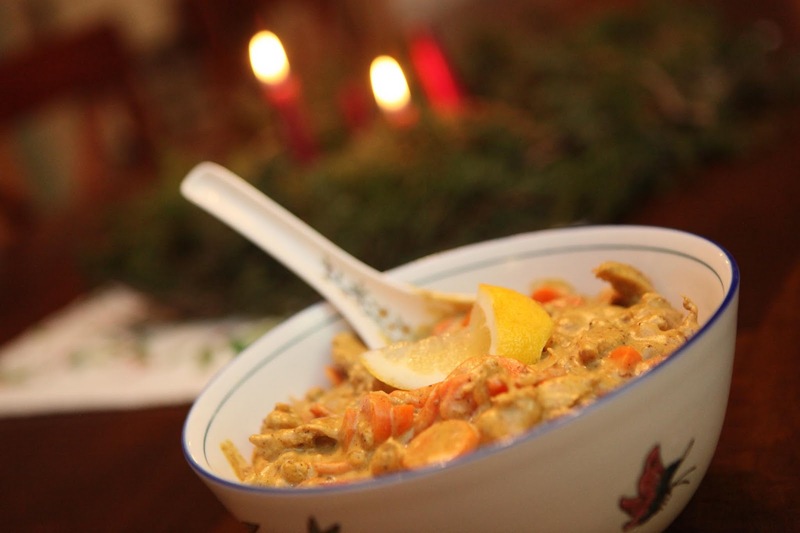 This is such a warming dish, that we have it often in the winter months. I make it with chicken, but you could easily make this all-vegetarian by substituting eggplant, potatoes, or anything else you enjoy. I pretty much just dreamed up this recipe, so I'm fairly certain it's not authentic in a cultural sense, but we love it so much that it's stuck with us for years now. 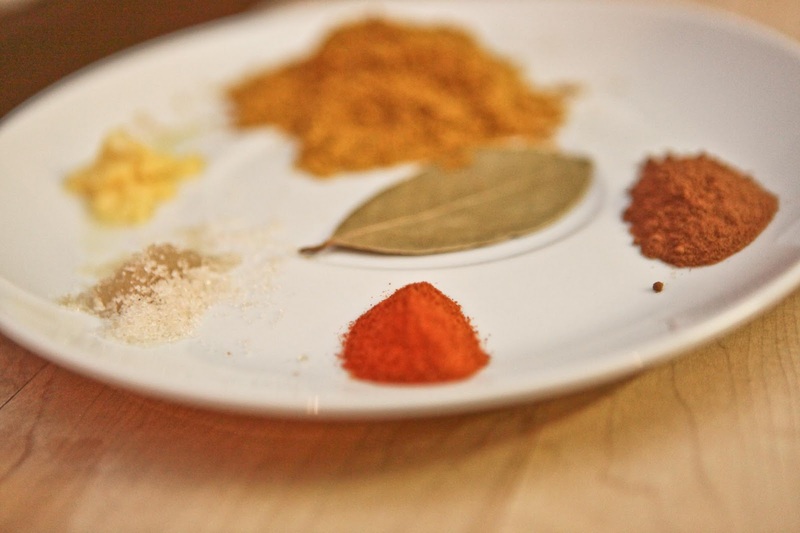 The spices in this curry are pleasantly fragrant, and I feel like cooking it even warms the house to its core, right down to the bones of the old wood floor. 1. 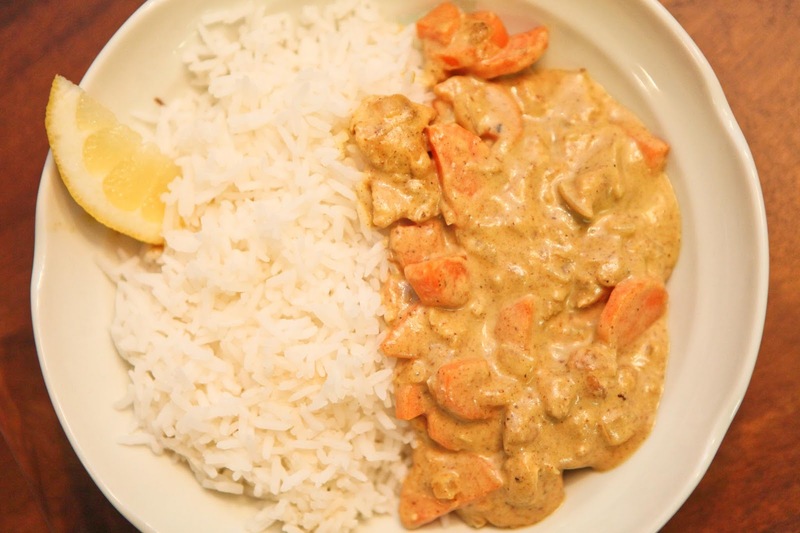 In a bowl, coat the sliced chicken breast with salt, pepper, and 2 Tablespoons of the curry powder. Let this sit for about 30 minutes, or as you prepare the other ingredients. 2. On high heat, coat a skillet with peanut oil. Add the onions and carrots, and cook until they just start to brown. 3. Turn heat down to medium. 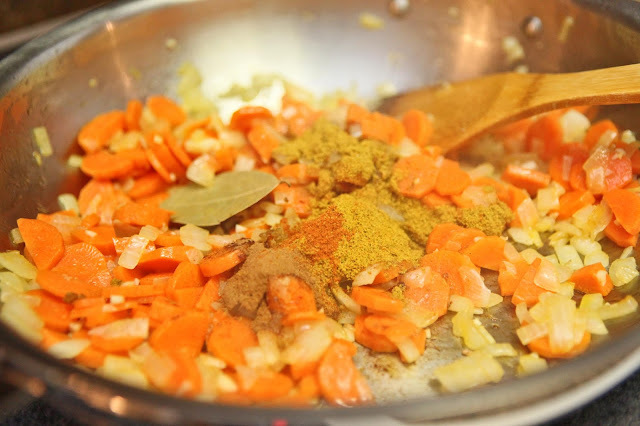 Add the garlic, ginger, bay leaf, sugar, and all the spices (including the remaining 1 tablespoon of curry powder). Brown the spices for a minute. 4. Add the chicken breast to sear for a couple minutes, turning the heat to medium-high if necessary. 5. Add the coconut milk and sour cream. 6. Simmer the complete dish for 20-30 minutes. Taste. If you'd like a spicier curry, add a bit more cayenne pepper. Sometimes a bit more sugar is in order if you like a sweeter curry. 7. Remove from heat and stir in the lemon juice. Serve with extra lemon slices on the side. 8. Eat with rice. Sometimes we also eat this with homemade flour tortillas cooked a minute or two in melted butter. Oh, my that looks so creamy and heavenly. I love a good curry, but still haven't found The One recipe in my kitchen and make something different every time. Maybe this is The One. Next time I pick up a can of coconut milk I shall try to remember it. Ooh, hope you like it, Beth! Let me know. By the way, I've also made this dish using only coconut milk when I don't have sour cream. Just add extra coconut milk and extra lemon juice, too for the same effect. @Little Home in The Country Thanks for stopping by! Let me know how you like it.